We recommend the Premium trim, as it only costs a bit more than the base model yet includes popular equipment (like cruise control) that some might miss. The 2013 Impreza retains the Subaru hallmarks of standard all-wheel drive, practicality, and durability, while packing in more features for the money—and it looks good doing it. The Subaru Impreza is the brand's champion vehicle when it comes to offering all-wheel drive at an affordable price. With Subaru's affinity for active, outdoorsy people, it's a car that makes sense, with its rugged edge over most other compacts on the market today. As part of those changes, Subaru introduced less polarizing styling, considerably better fuel economy, and more competitive pricing with a strong feature set. And of course, all-wheel drive remains standard on every Impreza. 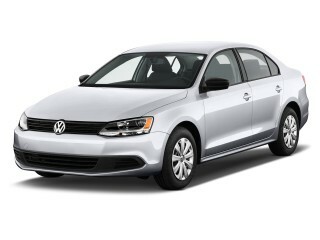 The 2013 Impreza is closer to the most popular compacts than it used to be (the likes of the Toyota Corolla, Honda Civic, Ford Focus, Chevrolet Cruze), but it's more often cross-shopped with the Mazda3, Volkswagen Jetta or Golf, or other affordable all-wheel-drive cars like the Suzuki SX4. In all standard Impreza models (the higher-performance WRX and STI models are covered by a separate review), a 2.0-liter horizontally opposed ('flat') four-cylinder engine makes 148 hp and 145 lb-ft of torque, transmitting it to all four wheels through either a five-speed manual gearbox or, for better gas mileage, the second generation of Subaru’s Lineartronic continuously variable transmission. The five-speed comes standard in lower-end models, but it's largely our preference between the two; the CVT is offered in all trims and standard in the high-end Impreza Limited. Handling is responsive and drama-free, but it doesn't quite win in the fun-to-drive category (that would go to the Mazda3 or Ford Focus). Last year's redesign yielded an exterior that's almost exactly the same size as the model it replaced, yet Subaru has made better use of the space, with a new seat design that has more passenger space and now folds flat. There's also a useful variety of bins, trays, cubbies, and cup holders, along with a pair of 12-Volt power outlets. Our only complaint about the interior is that you hear a bit too much road noise on some surfaces. The federal government still hasn't tested the current Impreza, but in IIHS testing it's earned the group's Top Safety Pick accolade and lived up to Subaru's generally top-tier safety performance. You'll find all the other safety equipment that's expected in this class, and with last year's redesign Subaru slimmed the pillars for better visibility. The 2013 Impreza remains offered in base, Premium, Limited and Sport Limited models. 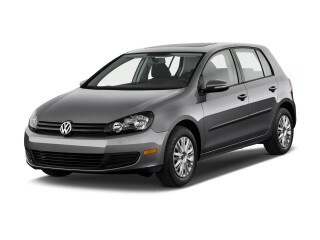 Premium models add popular equipment like cruise control and fog lamps. The Limited trim level adds 17-inch alloy wheels and the CVT with 6-speed manual mode and paddle shifters as standard, plus leather seat upholstery, automatic climate control, auto on/off headlights, an AM/FM/CD stereo with HD radio, and some trim options. One of the few options is a navigation system with a 6.1-inch screen. The Impreza's sleeker look, cohesive design, and tasteful details sum up in a way that feels more attractive and mainstream. Last year Subaru gave the Impreza a full makeover, keeping essentially the same dimensions but producing a much better-looking vehicle with a sleeker profile, helped by a more steeply raked windshield, a higher seating position, and a lower waistline. 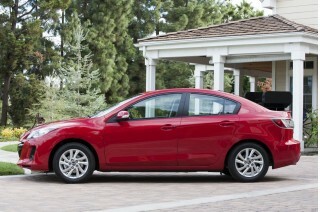 For 2013, the Impreza continues virtually unchanged inside and out from a design standpoint. The Impreza is hardly fashion-forward, but it is no longer dowdy or awkward. Subaru has returned to its traditional trapezoidal grille after recent flirtations with a variety of inconsistent grille shapes and styles. Along with “hawkeye” headlights, the Impreza now has a face that's recognizably related to the better-known Outback crossover utility. Along the sides, exaggerated wheel arches nod to the Outback, but also serve to break up the height of the flanks. The only disappointing area of the Impreza is the side view of the front fenders, where the wheels appear a size too small for the tall cowl and substantial front overhang. To our eyes the four-door sedan isn't quite as good-looking; it can come off as tall and stubby from some angles, but the five-door hatchback is quite neatly styled at the rear. A number of Impreza details echo other cars—the front hood line has a touch of Chevrolet Cruze, the taillights a hint of the latest Honda Civic, the sharply defined bumper edges recall the Chevy Volt. 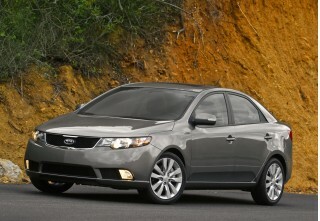 And overall, the form is far crisper and more coherent than the 2007-2011 Impreza it replaces. Underneath, if you care to look, there's been more attention to smoothing air turbulence and a longer undertray also reduce air drag, which helps with that other issue: gas mileage. Straightforward and functional would be a good way to describe the cabin design. The Impreza has neither the fashion-forward shape of the Ford Focus hatchback nor the interior panache of the Chevrolet Cruze’s twin-cockpit dashboard. But it’s also no longer the wallflower at the ball, and it's lost the gawkiness of the last generation. A half-oval cowl in front of the driver covers the speedometer and tachometer, with a square digital display screen between them. At the top of the center of the dash, an eyebrow cowl shades a wide multifunction display where less mission-critical data is displayed in larger and easier-to-read type. Modest matte silver accents divide the top dash and door surfaces from the vertical lower portions. Overall, the Impreza offers a sensible, no-nonsense cabin with few extraneous frills or electronic distractions. Only in a few places does the design come off as cut-rate; the plain, flat silver gear-shift surround is one, the plain black radio surround is another. Straight-line acceleration is no strong point for the 2013 Impreza, although it handles very well and all-wheel drive is standard. In all standard Impreza models (the higher-performance WRX and STI models are covered by a separate review), a 2.0-liter horizontally opposed ('flat') four-cylinder engine makes 148 hp and 145 lb-ft of torque, transmitting it to all four wheels through either a five-speed manual gearbox or, for better gas mileage, the second generation of Subaru’s Lineartronic continuously variable transmission. The CVT is electronically controlled to keep the engine operating at maximal efficiency regardless of what the driver asks the car to do. For the most part it's quite responsive, and the company has mostly avoided the usual downside of CVTs; the engine rarely races up to peak revs without a corresponding increase in road speed. Although the one thing we'd like to see changed is its very slow ramp-up of revs when a quick burst of power is needed. The five-speed comes standard in lower-end models, but it's largely our preference between the two; the CVT is offered in all trims and standard in the high-end Impreza Limited. Handling is responsive and drama-free, but it doesn't quite win in the fun-to-drive category (that would go to the Mazda3 or Ford Focus). Despite new electric power steering, the Impreza retains decent feedback at the wheel, though it’s not quite as eager and agile as the Mazda3. Brakes are progressive, as is typical for Subarus, but haul the car down from speed without fuss. The boxer engine also gives all Subarus a low center of gravity, and the Impreza is flat in cornering, accelerating neutrally out of corners with little discernible understeer—unlike virtually all of its front-wheel drive competitors. The 2013 Subaru Impreza has a space-efficient layout and good passenger comfort—provided you're not bothered by road noise. Last year's redesign yielded an exterior that's almost exactly the same size as the model it replaced, yet Subaru has made better use of the space, with a new seat design that has more passenger space and now folds flat. Seating in the Impreza is comfortable enough for adults in front and in the rear outboard positions, and packaging changes last year (including new scalloped front seatbacks) allowed two more inches of legroom in the back seat as well as easier entry and exit. Subaru has put a lot of thought into cargo capacity and versatility in the Impreza, too. Its rear seat folds fully flat, and the five-door model accepts many standard roof carriers. Also, befitting its practical, hey-let’s-go-kayaking-and-spelunking-today image, Subaru enlarged the hatch and trunk openings with last year's redesign, to accommodate a medium-sized dog carrier or a mountain bike with its front wheel in place (the headliner is even scalloped to allow two mountain bikes, standing upright with the front wheels removed. There's also a useful variety of bins, trays, cubbies, and cup holders, along with a pair of 12-Volt power outlets. Our only complaint about the interior is that you hear a bit too much road noise on some surfaces. Materials were recently improved, with soft-touch materials now covering the majority of the dashboard and center console, and controls are mostly simple and intuitive, with large round ventilation knobs and a particularly neat optional navigation system integrated into the radio. A peeve we noted in an earlier drive is that you need to reach through or around the steering wheel in order to cycle through the different modes on the central multifunction display; it's hard to operate when the car is moving, and should be moved to the steering wheel or main dash. One exception that keeps the Impreza from a higher rating here is wind noise from around the door mirrors, long a Subaru weak spot, and tire roar, which is excessive on certain surfaces. 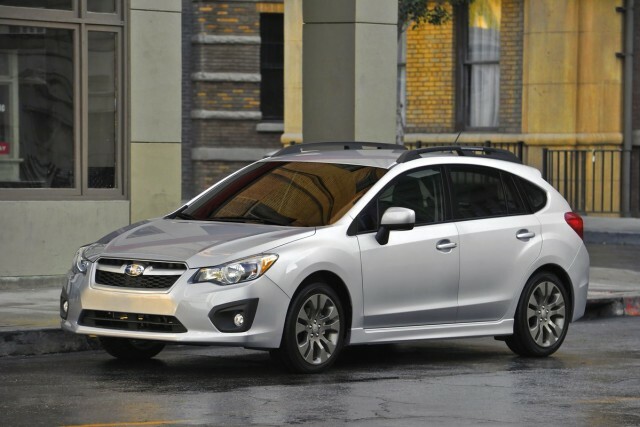 The 2013 Impreza keeps with Subaru's excellent track record for high safety ratings. The federal government still hasn't tested the current Impreza, but in IIHS testing the 2012 model earned the group's Top Safety Pick accolade—with top 'good' ratings in every category—and we expect the 2013 model to do the same. Subaru models from recent years have, with few exceptions, achieved top-tier safety ratings. The roster of safety features is good, too; in addition to the usual set of airbags, Subaru has added a seventh airbag to protect the driver’s knees. A brake-override system is also included. Subaru also improved outward visibility last year, by slimming the pillars; and with a relatively high front seating position and somewhat low shoulder line, there's now good visibility in most directions. The side-mirror design introduced last year is also 20 percent larger, providing a full field of rear view. The Impreza offers a lot of value for the money, although an advanced infotainment system is missing from the options list. The 2013 Impreza remains offered in base, Premium, Limited and Sport Limited models, ans all of them have a surprisingly strong set of standard features for the money—especially considering that all-wheel drive is standard. All Impreza models for 2013 include Bluetooth hands-free calling and audio streaming, iPod controls, a USB port, and an auxiliary input jack. Premium models add to the base model popular equipment like cruise control, alloy wheels, six-speaker sound, and fog lamps. The Limited trim level adds 17-inch alloy wheels and the CVT with 6-speed manual mode and paddle shifters as standard, plus leather seat upholstery, automatic climate control, auto on/off headlights, an AM/FM/CD stereo with HD radio, and some trim options. A navigation system with a 6.1-inch screen is one of a few options. There's also an appearance-oriented Sport Premium model that for 2013 gains a leather-wrapped steering-wheel and shift knob. Options include the Lineartronic CVT, the Navigation package, a power moonroof, a 17-inch alloy wheel package, and an all-weather package with heated front seats and exterior mirrors and a wiper de-icer. Four sound systems are available across the various models: standard, premium, a Display Radio with a 4.3-inch screen, and a Navigation Radio that neatly packages a navigation system that displays on a 6.1-inch LCD screen. However there's no single infotainment system that wraps connectivity, apps capabilities, and navigation together. The Outback Sport model is gone, replaced for 2013 by a new, outdoor- and activity-themed model, the XV Crosstrek. With an EPA fuel economy rating of up to 36 mpg highway, the Impreza is again expected to be the most fuel-efficient new AWD vehicle in the U.S. The 2013 Subaru Impreza is expected to be the highest-mileage gasoline all-wheel-drive vehicle in the U.S. market, reprising its 30-mpg EPA Combined rating and a highway rating of up to 36 mpg. With the continuously variable automatic transmission (CVT), the 2013 Impreza sedan and hatchback get 27 mpg city, 36 highway, while are expected to earn EPA ratings of 27 city, 36 mpg highway, for a combined 30-mpg rating, a 30-percent improvement over last year’s figures. Manual numbers are somewhat lower, at 25/34 mpg. 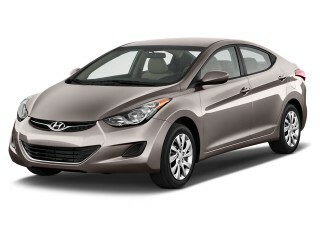 And that 36-mpg highway rating enables an impressive cruising range of up to 523 miles. The Impreza is clean enough to earn the designation of Partial Zero-Emission Vehicle, or P-ZEV—the label for vehicles that follow California’s stricter emissions standards; and Subaru has decided to offer it in all 50 states, not just where it's required. Love my Suby, but there have been some electronic issues that have been annoying although handled by the dealer well. I do enjoy my Impreza Sportas it is comfortable and drives well both in city and on the highway. I really like the paddle shifters for braking on a long hill or punching out for quick acceleration. There is... I do enjoy my Impreza Sportas it is comfortable and drives well both in city and on the highway. I really like the paddle shifters for braking on a long hill or punching out for quick acceleration. There is lots of room for storage and can hold 5 people when required. Really enjoy the heated seats.